Viruses depend on host cells for replication, but how does a virus induce its host to transcribe its own genetic information alongside that of the virus, thus producing daughter viruses? For decades, researchers have been studying a type of bacteriophage known as ‘lambda’ to try and find an answer to this question. 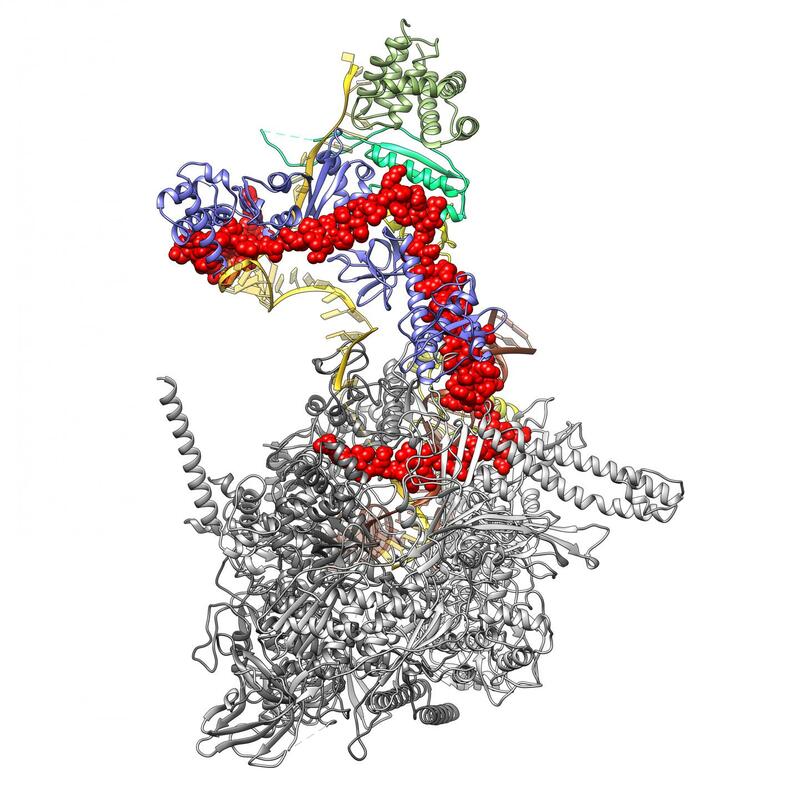 Using high-resolution cryo-electron microscopy, a research group from Charité – Universitätsmedizin Berlin has now successfully deciphered this process. Their findings have been published in Molecular Cell*. No host, no viruses. While it is true that viruses are capable of spreading by surviving outside a host, they need a host for replication. Viruses lack the complex apparatus necessary for the transcription of genetic information and its subsequent translation into new virus components. This is why all viruses need access to a host cell’s molecular infrastructure. For decades, researchers have been studying the ways in which viruses successfully exploit host functions. Their efforts have been focused on ‘bacteriophages’ – viruses that rely on bacterial hosts for replication. One of the most intensively studied and best characterized of these is the ‘lambda phage’. Previous research had shown that the lambda phage introduced its own genetic information into that of its host, inserting it at a specific site in the host genome. ‘RNA polymerase’, a protein complex responsible for transcribing genetic information, would normally stop reading this information at the end of the bacterial gene and would ignore any viral genes inserted behind it. The virus uses a trick that prevents the RNA polymerase from terminating the transcription process: it introduces ‘lambda-N’ (λN), a tiny protein which attaches itself to the host’s RNA polymerase and forces it to continue transcription of the viral genes. Until now, and despite intensive efforts, researchers had failed to identify how this tiny protein can achieve such a feat. A Berlin-based team of researchers has now been able to visualize the 3D structure of the RNA polymerase-λN-complex using high-resolution imaging, enabling them to provide a detailed explanation of this ‘viral exploitation’.